Cheetahs are known for many things: superlative speed, feline gracefulness and remarkable agility. I would also like to add another trait to that list – they have tongues like 80 grit sandpaper, and if they lick you, it’s not polite to laugh. 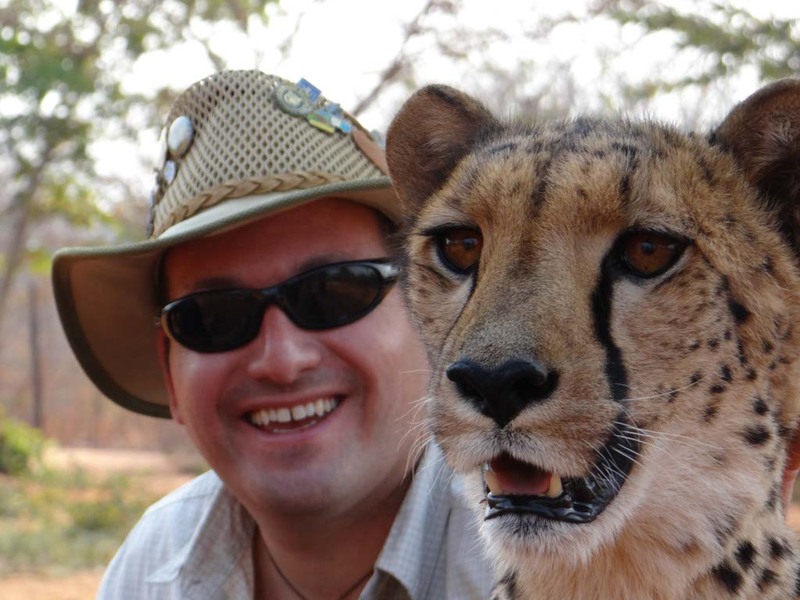 I never knew about that last one until August of 2014 when I experienced Mukuni Big Five Safari’s Cheetah Walk program near Livingstone, Zambia. After that, there was no way I could forget. 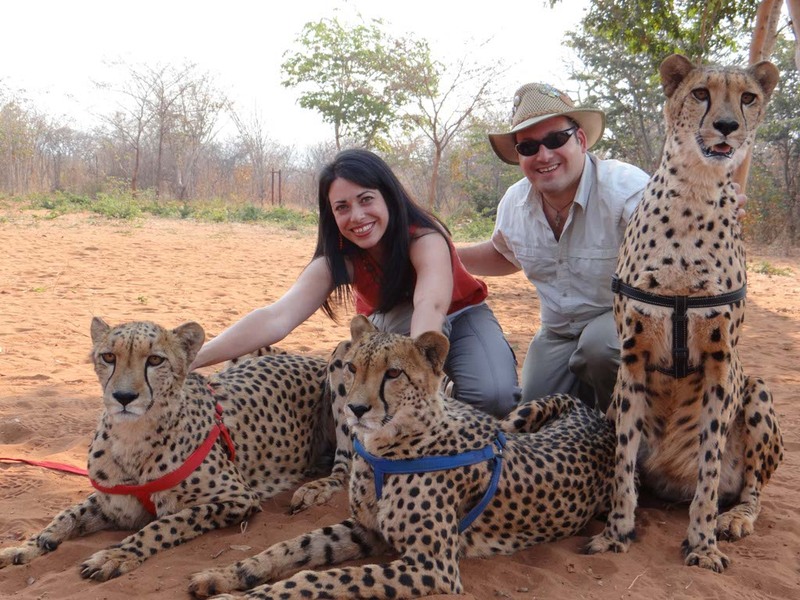 The company’s stated objective is to conserve and breed the threatened cheetah through education and understanding. Both education and understanding are accomplished via the opportunity to interact with these magnificent creatures in a way that very few do. As an animal lover, I was impressed by the kindness and attachment they showed toward the animals under their care, which left me feeling good about the type of treatment they receive. With your consciences now clear, let’s move on to how you too can experience this bucket list item for yourself. Complimentary hotel pick-up is included in the price (approximately $120 US per person) for those staying in the Livingstone area. If you’re staying in Victoria Falls, Zimbabwe, the camp is only a few kilometers from the Zambian border, but will likely require a 24 hour visa available for purchase onsite. See your friendly neighborhood Zambian customs control officer for current prices. Guests are ushered into an open-air reception center where they can enjoy a cup of coffee and pay their fees while waiting for their safari. This is also where you will be asked to sign a waiver exonerating the company of all responsibility in the event of being eaten, chewed upon, or trampled to death by any of the animals. If you chafe at the thought of relinquishing such rights, bear in mind that even the remote possibility of any of the above happening means that you are in for a special experience. Just sign it and leave the legal mumbo-jumbo for your lawyer. Before you get to interact with the cheetahs, you will first be escorted to a large, fenced-in clearing where the guides will have them waiting for you. Your guide will then explain a lot of details that you will completely ignore as you admire the cats up close. From the little I can remember, you are advised to only approach them from behind, avoid making sharp noises (like laughing loudly when they lick your head) and for some reason refrain from touching the inside of their ears. I can only imagine how it was that someone figured out that last little tidbit. I’m assuming they’re the reason the rest of us have to sign a waiver. Once the whole introductory spiel is over, you’ll finally get your chance to pet the kitties. As the largest cats that purr, the sounds of the bush will be drowned out by the throaty rumble coming from the cheetahs as they sprawl out under your excited caress. I’d be willing to bet that my wife didn’t take her hands off the cats even once in the entire twenty minute session. When it was finally my turn to join her, I was thrilled to run my fingers through their soft fur and exposed bellies. I should also mention that this is when the licking began. Our guide had just finished explaining that as a sign of contentment, if you offer them your forearm they might lick you in return. This resulted in the exfoliation of a lifetime as the cheetah went to town on my right arm. I was both chuckling and wincing at the same time until I noticed that one of the handlers had one-upped me by offering the cheetah his head. 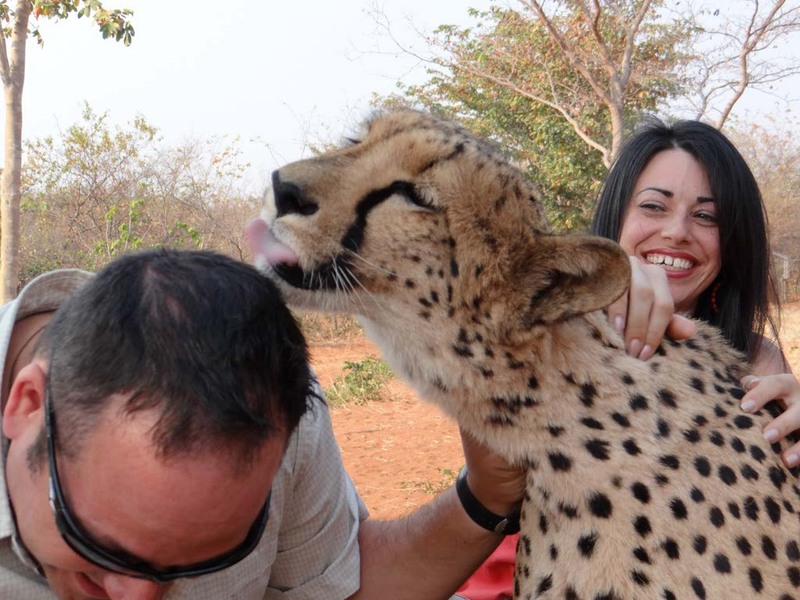 Not to be outdone, and consistent with male-competitive stupidity, I too offered the cheetah my head, and soon enjoyed an abrasive tongue-bath along my forehead and scalp. As entertaining as it was, I think I’ll just stick to shampoo. I will say that as that cheetah tested the limits of my remaining hairline, it was hard not to indulge in the aforementioned laughing as I considered the absurdity of the scene. If it were possible to ask my friends and relatives back home what they thought I was doing at that very moment, I’m pretty sure having my head licked by a cheetah wouldn’t even make the top ten. Signing away my legal rights for the chance to do something crazy, on the other hand, would certainly make an appearance. 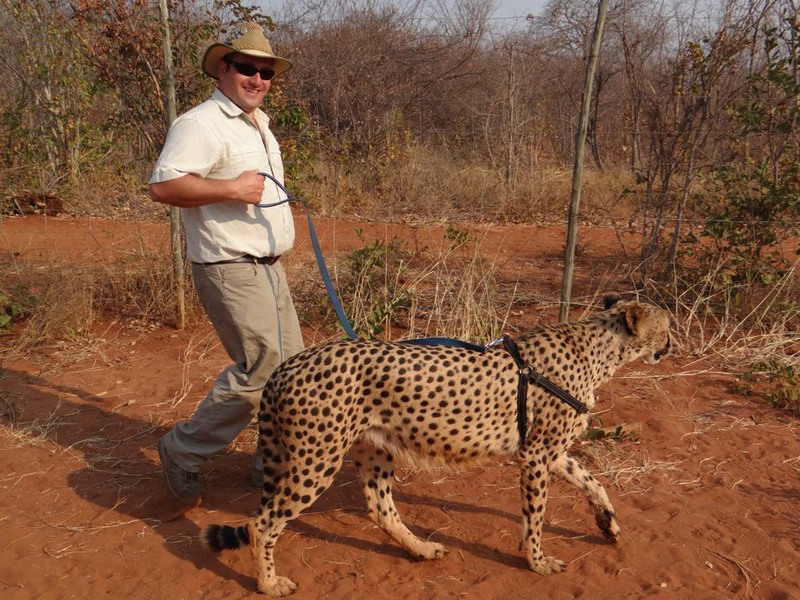 As if the interaction wasn’t already worth the price of admission, the next phase is to ‘walk’ your cheetah on a guided tour through the surrounding bush. While eager to do so, I did have some questions. Foremost, was what do I do if it decides to run? I won’t be able to catch it—it’s scientific. That extra twenty pounds I need to lose has nothing to do with it. Fortunately, even if the cheetah did make a run for it, these particular cats would return on their own. So instead of worrying about a footrace, we were able to enjoy our bushwalk in the company of predators, which was sort of like strolling through a rough neighborhood while escorted by local gang members—as dangerous as it might be, nobody’s going to mess with you. Eventually our time with the cheetahs, like all good things, came to an end. It was then that I realized how important it is that we conserve our planet’s natural habitats so that majestic animals such as these will have a secure home for future generations. It was also then that I realized that the next time I saw a cheetah, I probably shouldn’t let it lick my head. Either way, I felt like I walked away with a greater understanding to go along with my bucket list experience. Where do they get the cheetah’s in the first place? Are they taking them from the wild? Did you feel safe? I’m not sure interaction with a wild animal like this is good for anyone, especially the animals. I’d like to know more. Those are some gorgeous looking cheetahs! I was able to get up close with one in Oudtshoorn, South Africa. I love their loud purring and gracious walk. The cheetahs I saw in South Africa are not as big as the ones in your photos, they look huge!